While much of Houston and southeastern Texas remain underwater, another succession of hurricanes — first Irma and then potentially Jose — is bearing down on the Caribbean and Florida. Storms like these are expected to be more frequent and more severe as climate change progresses, Basav Sen writes this week. Sadly, our political system makes the problem far more intractable. To start doing something about it, he explains, we need to get money out of politics. Meanwhile, there’s a brewing political storm. 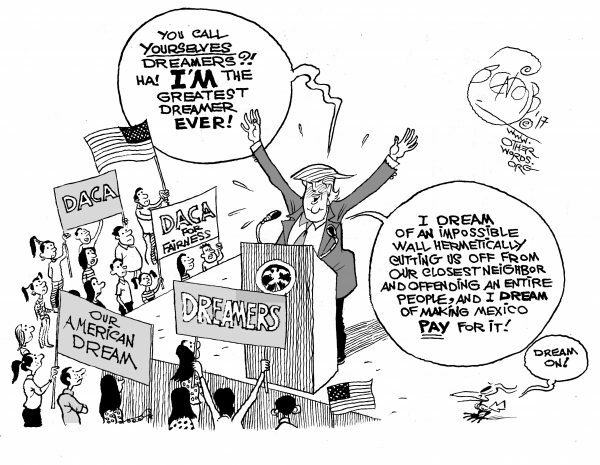 Donald Trump has announced the end of the DACA program that protects law-abiding undocumented Americans who were brought here as children — the so-called “Dreamers.” But Trump’s delusions on immigration make him the real dreamer, Khalil Bendib quips. Also, we’re on the verge of a big national debate about tax reform. Josh Hoxie warns you not to believe the hype about tax cuts for the rich being good for the rest of us, while Aditi Katti floats an idea to expand a popular tax credit that helps low-income working people. Finally, Jill Richardson reports on the growing use of GMOs designed to withstand toxic pesticides, while Jim Hightower eyeballs Wall Street’s new toxic loan fad: subprime auto loans. Big money will pull out all the stops to sell you a tax plan that exclusively benefits the wealthy. Don’t buy it. The Earned Income Tax Credit may be the most popular bipartisan anti-poverty tool. So why won’t the feds expand it? Our culture of legalized bribery makes climate disasters more likely, but there’s an alternative. Wall Street is siphoning billions of investment dollars into high-risk, subprime auto loans.